Fits Austin Healey models 100-6 BN6 and 3000 BN7 models. Factory style 1 piece top with a plastic/vinyl window. Also includes 4 tenax and other fasteners. We offer it in the leather texture vinyl and the upgraded Stayfast canvas. Seams are heatsealed from the inside and outside. 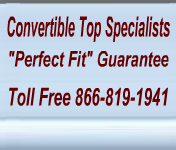 The Austin Healey convertible tops have excellent workmanship, superior fabrics and attention to detail that will ensure you will enjoy your convertible top for a very long time. for your new Austin Healey convertible top. This top fits the 1957 Austin Healey 100-6 convertible, 1958 Austin Healey 100-6 convertible, 1959 Austin Healey 100-6 convertible, 1960 Austin Healey 100-6 convertible, 1961 Austin Healey 100-6 convertible and 1962 Austin Healey 100-6 convertible. Bison vinyl is a leather grain vinyl with a cotton backing.